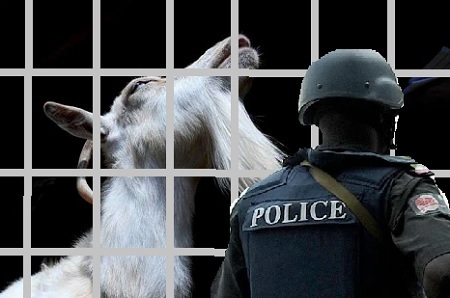 According to foreign online Newspaper, the vigilantes seized the black and white goat, saying it was an armed robber who had used black magic to transform himself into an animal to escape after trying to steal a Mazda 323. 'The group of vigilante men came to report that while they were on patrol they saw some hoodlums attempting to rob a car. They pursued them. 'However one of them escaped while the other turned into a goat,' Kwara state police spokesman Tunde Mohammed said. 'We cannot confirm the story, but the goat is in our custody. 'We cannot base our information on something mystical. It is something that has to be proved scientifically, that a human being turned into a goat,' he said. Belief in witchcraft is widespread in parts of Nigeria, Africa's most populous nation.